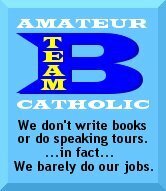 Hey, I figure, even after 38 years of being Catholic, I’m still an amateur. The professionals, well, ain’t many of them hanging around the blogosphere, or on this sphere for that matter. The Communion of the Saints, that’s where all the professionals hang. The rest of us, we’re just trying to make the cut! Well, I’ve never been too good at being the perfect Catholic. It all started at my First Communion, when I couldn’t figure out why that bead necklace, with the cross on the end, wouldn’t go over my head. Yes, I had a big head even then. I lost the crucifix ring I got from my godmother in a football game. I never thought much about being a priest as a kid. I wanted to be an astronaut, a scientist or an actor. Well, by the time I got to high school, there wasn’t much demand for astronauts, I hated Chemistry, and I only got non-speaking roles in the high school plays. My biggest role, however—I played a priest. I even had a couple of lines, but they got cut. I started doing ministry in high school, but still the priest idea never really occurred to me. I should have known, however, that God was going to demand something more of me when one day my car stalled and as I was trying to move it off the road into a parking lot (not thinking about the fact that the lot was on an incline), I lost control of it and wasn’t able to stop it until it had slammed into a small building. Turns out, it was a shrine. Later that week, a local newspaper columnist did a story on the shrine, describing the building as having six pillars and then noting, “well, usually it has six pillars, today it has five.” I bet you’d be surprised to know how much one of those pillars costs! So, from then on I took to describing myself as the man that got “smashed” at Saint Anthony’s shrine! A little impious, maybe, but I told you I wasn’t perfect! For the first eight years of my adulthood, I bounced around from one job to another and managed to do my share of schoolwork. I had a lot of fun, and also started to notice how much time I was spending doing Church stuff. I did most of my ministry with kids, which probably explains while I’m still something of a kid myself, and probably why an uncharitable blog commentor recently felt justified in calling me a “pseudo-intellectual.” I’ve never took too much offense at such comments. I’ve always took it to mean that I’m someone who can engage serious topics and still have a life (one of my grad school professors, who didn’t think I was a serious enough scholar, once called me an “A minus”). But, eventually, God caught up with me (or was it Saint Anthony? He was an Italian, you know). Unwittingly, a CFR priest set me on the path of becoming a Jesuit. I entered the Jesuits as a mere youth of 29, just 5 days short of my 30th birthday and as the name of my blog implies, I’ve been duped ever since. But, like Jeremiah says, I let myself be duped. I have found the time recently to work on a couple of books. But, since technically I don’t make any money from them—something to do with a vow of poverty—I think that still makes me an amateur. And, of course, I’m still far from the professional ranks when it comes to being Catholic. But I’m gonna keep practicing. As soon as I can get off the internet! As I said before, it wuld be a sin not to promote a loyal Jesuit. It's not like we'd be over-worked or anything. I still think St. Anthony got a few chuckles from that event to. ;) Welcome! I was Jesuit educated, in San Francisco no less, which I think says everything. Fr. Mossa, I am so excited that you are blogging and I look forward to reading your blog! Rebecca, happens all the time. Or I get confused with another Jesuit whose name is Mark Massa!